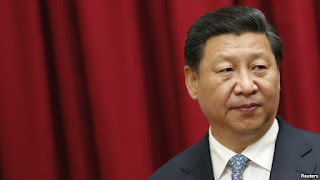 Chinese President Xi Jinping next week will make his first state visit to the U.S., a White House statement confirmed Tuesday, a trip that comes at a time of increasing disagreement between Washington and Beijing. President Barack Obama "will host Xi Jinping, President of the People’s Republic of China, at the White House for an official State Visit on September 25, 2015," according to the late Tuesday statement. The prestigious visit, which follows Obama's trip to Beijing in November, will include a lavish State Dinner at the White House that will be attended by the spouses of both leaders, said the statement. The visit offers a chance "to expand U.S.-China cooperation on a range of global, regional, and bilateral issues of mutual interest, while also enabling President Obama and President Xi to address areas of disagreement constructively," it added. Recently, the areas of disagreement have threatened to overshadow areas of cooperation. One of the main areas of friction is what U.S. officials call a barrage of China-based cyberattacks on American government and business targets. Obama last week called the cyberattacks "unacceptable." "There comes a point at which we consider this a core national security threat and we will treat it as such," said Obama, who said Beijing would regret making the matter an "area of competition." "I guarantee you we will win if we have to," the U.S. leader warned, using unusually blunt language. White House spokesman Josh Earnest said he expects Obama to discuss cyberattacks during his meeting with Xi, acknowledging it is something the president is "quite concerned about." China denies any role in cyberattacks on U.S. businesses, government and other critical infrastructure, insisting that it is the victim of such attacks. Another increasingly sore point in relations is China's behavior in the East and South China Seas, where Beijing has territorial disputes with many of its neighbors. The U.S. says it does not officially take a position on the sovereignty disputes. But Washington has constantly criticized China for its aggressive behavior toward its smaller neighbors and developed closer military ties with many of China's rival claimants. The most recent U.S. concern has focused on China's building and military development of numerous artificial islands in the South China Sea's contested Spratly Islands. The islands are seen as a way for China's military to exercise de facto control of the area surrounding the Spratly Islands, parts of which are also claimed by Vietnam, Taiwan, the Philippines, Malaysia, and Brunei. The U.S. has called on China to stop the island-building and allow for freedom of navigation in contested areas. China says its activities are peaceful in nature and that it does not impede freedom of navigation. For its part, China is concerned that the White House's attempts to "pivot" U.S. security and diplomatic policy toward Asia are an attempt to contain Beijing's rise, an accusation that U.S. officials deny. Rights groups are also urging Obama to make human rights a priority during Xi's visit. A letter signed by the heads of nine human rights organizations, including Human Rights Watch and Amnesty International, expressed deep concern about "the significant erosions to rights during President Xi’s tenure." It called on the White House to invite "representatives of China's persecuted rights advocates" to the White House ahead of the Xi visit, in order to send a "strong message" that his government must "end its persecution of civil society." During past high-level meetings, Obama administration officials have been reluctant to publicly criticize Chinese leaders on human rights issues, presumably out of fear this could jeopardize important areas of cooperation. One of the main areas of cooperation between the U.S. and China is climate change policy, which figures to be a major focus of Xi's visit to Washington. During Obama's visit to Beijing last year, the U.S. announced a goal of reducing carbon emissions by 26-28 percent below its 2005 level by 2025, while China for the first time committed to peak its carbon emissions by 2030. The agreement was seen as a landmark moment for the world's two worst emitters of climate change-causing greenhouse gases.